There’s been something in the air this spring. Can you smell it? Two of 2017’s three cheekiest guerrilla bike lanes have now been made permanent. The Providence Journal reported Tuesday that the City of Providence, R.I., has taken a local group’s stunt to heart and started installing flexible plastic posts where a row of plungers had been set up, separating a “floating” parking lane from a curbside bike lane on downtown’s Fountain Street. Similar plunger-bike-lane stunts this year came in Wichita and Omaha. Wichita, too, made its short stretch of plunger protection permanent two weeks later. Parking-protected bike lanes have become common across the United States. But practices differ on whether to include plastic posts. Posts cost about $60 apiece, including installation time, but they make it more obvious where people are (and aren’t) supposed to park their cars. The Journal reported that the new posts can be removed during the winter, if necessary, in order to keep the street plowed. Organizer Jeffrey Leary, 49, told the paper he spent $72 on the Providence demonstration: $1 per plunger. “I think it’s a really effective way of bringing about change and bringing things to the attention of officials,” she said. Maureen Persico of San Francisco, organizer of a temporary person-protected bike lane. Photo: Roger Rudick, Streetsblog SF. 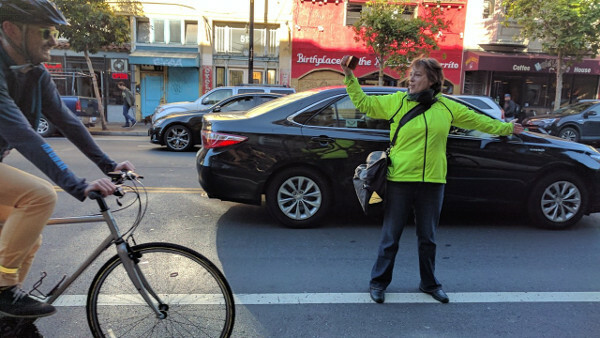 Meanwhile, across the continent in San Francisco, residents have been on a slightly different campaign: They’ve literally been standing in the streets themselves to call attention to the number of people who try to pull across unprotected curbside bike lanes in their cars. That, too, has prompted local politicians to call for permanent physical protection. Maureen Persico, a lead organizer of the San Francisco action, said direct, fun local actions like these can be powerful during a time of national political turmoil because they can open a “little crack” in people’s walls of cynicism or isolation.